Trees at the site of the Tunguska Event. 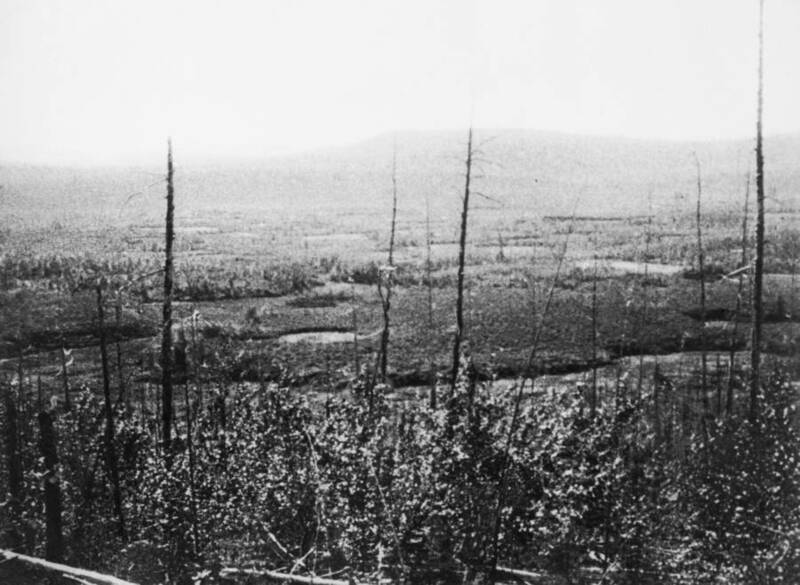 The Tunguska Event flattened 80 million trees in the area. One day in 1908, an explosion 1,000 times greater than that of the atomic bomb dropped on Hiroshima erupted in the remote Siberian wilderness, shattering the calm of the icy landscape and flattening 80 million trees in the area. What exactly caused this devastating blast is still in question to this day. On June 30, 1908, at around 7:17 a.m. local time, the few inhabitants of the remote Siberian region of Krasnoyarsk Krai awoke to see a column of blue light, nearly as bright as the sun, moving across the sky. Then they heard a devastating boom, and shockwaves traveled across the area shattering windows and knocking people flat off their feet. Other eyewitness accounts include that of Luchetkan, a member of the indigenous Tungus people of the region, whose relative herded reindeer in the area of the blast. 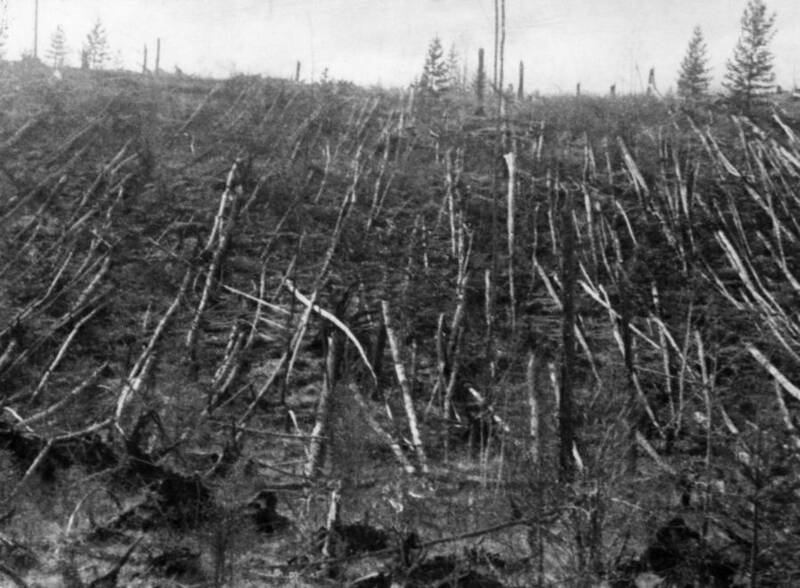 Siberian forest that was flattened by the Tunguska explosion. The owners of two gold mines in the area called one another on early telephones to accuse each other of illegally dynamiting in the area. Due to the remote nature of this region, there were only two reported casualties from the explosion. From the outset of the event, researchers quickly concluded that the blast was an air burst caused by a massive meteor falling to earth. In 1921, more than a decade after the event, Soviet scientists set out for the first time to investigate the blast. They wanted to find the meteor for the iron and other mineral deposits it likely held. However, they were unable to find any crater at the epicenter of the blast, near the Stony Tunguska River. Instead, they found a ring of scorched trees, still standing, with their branches torn off. Surrounding these trees was a butterfly-shaped zone of trees that had been scorched and knocked flat by the explosion. While these scientists concluded that it must have been a meteor that exploded while entering our atmosphere, they did not discover any impact craters from the potential fragments. Many small indentations were initially considered but were ultimately rejected as these small craters. With no clear proof of this cause for the blast, other theories on the Tunguska Event began to emerge. 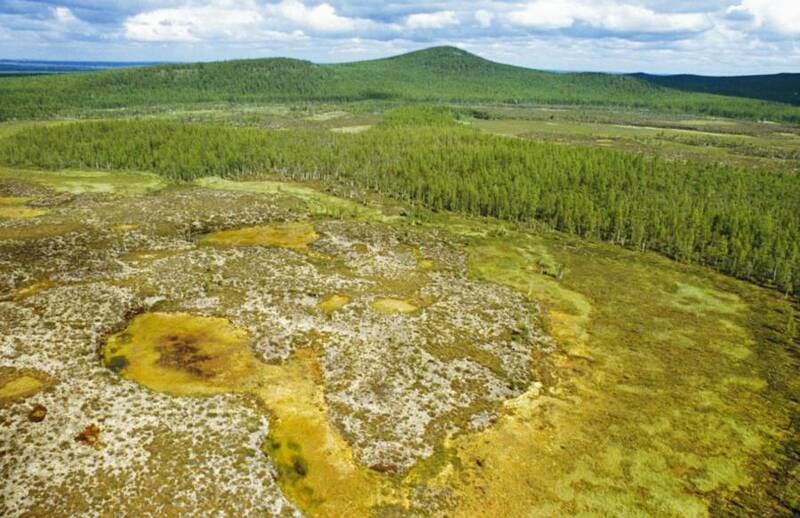 100 years later, a new forest is growing on the site of the Tunguska explosion. Siberia, 2008. British astronomer F. J. W. Whipple suggested that the Tunguska body was actually small comet. Unlike meteoroids, which are celestial objects made out of minerals and rock, comets are structures composed of ice and dust. Whipple believed that this could account for the fact that no part of the meteor was recovered, as a comet could have caused the explosion while entering the atmosphere, but have completely burned up due to the heat of entry. This theory could also explain the glowing skies observed across Europe in the days following the explosion, as they would have been caused by the comet’s trail of ice and dust falling into the atmosphere. However, others have disputed that a comet could have reached that far into earth’s atmosphere to create the blast. This lead to the theory that the Tunguska body was an extinct comet with a stony mantle that allowed it to penetrate the atmosphere. Other theories on the Tunguska Event exist as well, including one by astrophysicist Wolfgang Kundt who proposed the theory that the explosion was caused by an explosion of 10 million tons of natural gas released from within earth’s crust. To this day an impact crater for the Tunguska body has never been found, leaving this enormous explosion still a scientific mystery waiting to be cracked.